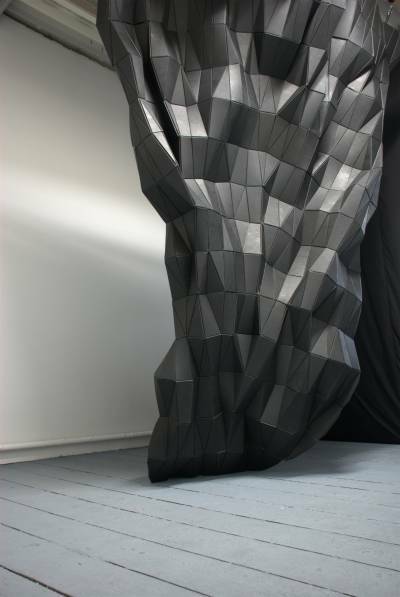 Sculpture assembled from custom-designed and manufactured modular system. Custom polypropylene (plastic) tiles, cable ties, blackout tape, rope, aluminium and fixings. Custom manufactured polypropylene tiles were assembled in an improvised fashion to create a single large form which was then suspended from the ceiling. The three tile types, two triangles and one trapezoid, and their possible combinations, constitute a set of rules, a framework which plays a part in determining the work's form. I think of it as a kind of 'movie still', some kind of flow, frozen for a brief moment. Two images of this piece were published as a spread in issue 19 of Building Material, the journal of the Architectural Association of Ireland. flexible units/still was exhibited as part of De l'émergence du phénix at the Centre Culturel Irlandais from November 25th 2011 to January 20th 2012. The show was curated by Caroline Hancock. 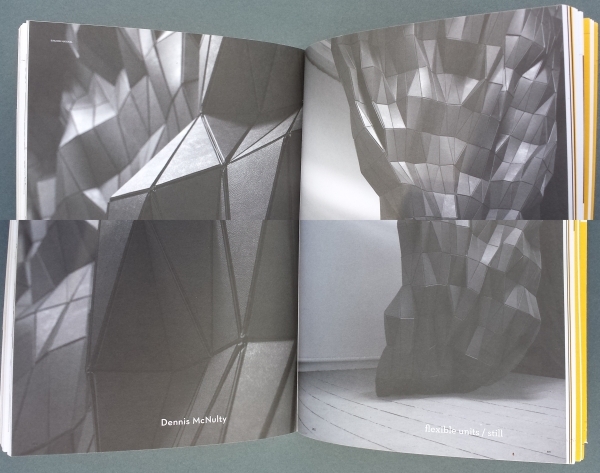 Spread from Building Material, Issue 19 : Art and Architecture, Autumn 2009. Architectural Association of Ireland. Edited by Stephen Mulhall.